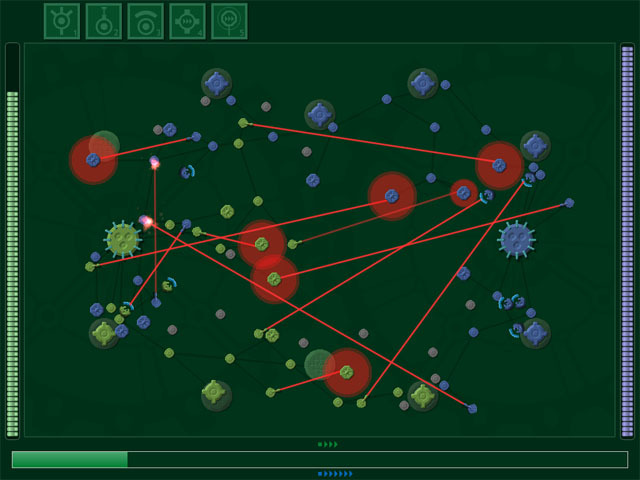 The players build nodes by using energy. Energy is obtained via various means in the game, like extractor nodes. You can see your total energy pool as a bar on the bottom of the screen. You can also see your current energy income above the bar and your opponents income below the bar. It takes a fixed amount of energy to build each node. You can see what that amount it by pressing the corresponding button above the playing field and looking at the hilited section of the energy bar. Be careful with how you use your energy, without any income, youre a sitting duck. Conversely, the best way to beat an opponent to to force them to waste their energy.